"Half of the Rift Valley leaders have decamped from Jubilee to NASA." Samburu elders claim. - Bana Kenya News, Real African Network Tubanane. Home News "Half of the Rift Valley leaders have decamped from Jubilee to NASA." Samburu elders claim. "Half of the Rift Valley leaders have decamped from Jubilee to NASA." Samburu elders claim. Half of the Rift Valley leaders have decamped from Jubilee to NASA. Turkana, Kajiado, Narok, Pokot, and Bomet are among the top counties with the highest numbers of leaders decamps. 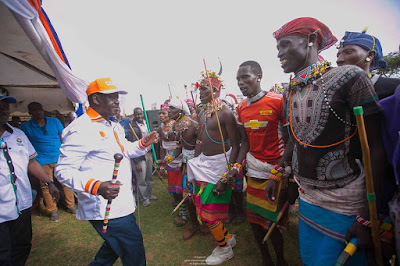 Lately, Chesumei Member of Parliament (MP), Elijah Lagat, and former Mosop Legislator, David Koech, have abandoned President Uhuru Kenyatta’s Jubilee Party and joined Raila Odinga’s National Super Alliance (NASA). Speaking on Tuesday, July 18 while launching NASA campaigns in Eldoret, the leaders led more than ten MPs in joining the opposition, accusing the Jubilee administration of failing to provide for the needs of local farmers since they took office in 2013. “The Jubilee government has frustrated the farmers in this country. We have launched intensive campaigns for NASA in Rift Valley to vote out a failed government. We have looked at NASA’s manifesto and felt that it suits us best,” said Mr. Lagat. Former Emgwen MP, Stephen Tarrus, also accused Jubilee playing divisive politics by sidelining the Rift Valley region in terms of development projects. “We, as people of Rift Valley, are fed up with fake Jubilee promises. Jubilee should not think that we have moved to NASA individually. We have moved with the masses,” said Mr. Tarrus. On his part, former Marakwet West MP David Sudi exuded confidence that NASA flag bearer Raila Odinga will trounce President Kenyatta come August, insisting that Rift Valley residents too wanted to be part of the ‘Mabadiliko’ wave that is sweeping Kenya. The NASA inroads to the Deputy president backyard has born fruits as the high living standards, poor governance affects them too.